The Provincial Fabric House is a reputed name for Upholstery Suppliers in Australia. It’s your one-stop destination for high-quality upholstery fabric online. We are experts when it comes to upholstery fabrics. We deliver you the finest hand-picked fabrics from prestigious European mills at reasonable rates. Established in 1994, Provincial Fabric House is located in Southern Highlands of NSW. Our fabric shop supplies upholstery fabric online as well as offline throughout Australia. We have built and spread our love for fabric on International grounds too through fast and reliable shipping. Not only do we sell upholstery fabrics but we provide knowledge about these fabrics to our users through our inspirational blog. Exceptional holiday sales at our fabric shop have always been appreciated by our customers. Free fabric swatches for new fabric buyers is another eye-catching offer to avail at our fabric house. Look no more, for you are at the perfect arena of upholstery fabrics. Take a look at our enormous collection of designer fabrics today. Buy the Best, From the Best! Vibrant colour palettes, delicate designs, soft shimmer from reputed fabric mills make our fabrics stand out from the rest. Brought to you on a platter is the beauty with variety. Our offline warehouse of fabrics is located at 2 Currockbilly Street, Welby, NSW, 2575, Australia. For those who are not accustomed to purchasing online, shop our local store at your ease. We have a limited inventory of exclusive and elite designer fabrics. So if you happen to set your heart on any one fabric, purchase it today so that you do not have to settle in for a second choice. Belgian linen is premium linen that is harvested as well as processed into a finished product exclusively in Belgium in Northern Europe. This a luxurious expensive high-end linen upholstery fabric especially crafted by Belgian craftsman to ensure you get the best quality linen. Derived from cotton seed pod, the most familiar day-to-day fabric comes in the choicest of patterns at our fabric shop. Breathable and affordable makes it a popular routine upholstery fabric. Cotton blends are also accessible in our collection to provide you variety in routine upholstery fabric. Linen is a natural and versatile fabric. It has a classic feel, soft and smooth touch that can brighten up every surrounding. Linen Fabrics are stiff and naturally thermoregulating. A property to reflects the heat makes it easy to deal with in summer. Choose linen as your summer upholstery fabric to let it energize your summer days. Velvet is a luxe baby soft woven tufted fabric. It has the ultra-sheen and quirky smoothness for a piece of high-end upholstery fabric. Deck your room in the ultimate grandeur with this upholstery fabric. Hemp is a sustainable and eco-friendly fabric. It only gets better with every wash, retains colour and is very breathable. The upholstery arena has never come across such a remarkable and highly sustainable product. Hemp is definitely the most sustainable fabric of all times. Wool is a favourite winter fabric. Its unique weave and thickness ensure you stay warm and cosy. When draped over your upholstery furniture, it is sure to make eyes turn with the deep richness it exudes. Australia is the top producer of quality Merino wool and we bring you this finest quality at affordable prices. The most luxurious and soft fabric of all time. Silk is shimmering, glossy and pleasing to the eyes. This fabric is known for its royal touch. Our silk collection has varied hues and inbuilt designs specially crafted to bewitch your eyes. Rayon is a semi-synthetic fibre trending as a very versatile and durable upholstery fabric. It has high wear-and-tear resistance. Rayon is cool, soft and smooth and commonly known as “Artificial Silk”. Provincial Fabric House is a well-established upholstery supplier brand. For the comfort of our esteemed customers, we have introduced a Free Fabric Sample for First Time Users and Buyers. You can order a free sample on our website or offline store. You will get the real touch and feel of the fabric only when you have it in your own hands. To order online, go to Our Fabric Shop, Select Fabric of your Choice and click on “Order Free Sample”. A set of 5 free fabric swatches is offered to you at a minimum shipping fee of $15. In the sample, you will receive a cutting from the fabric roll. You can evaluate the colour, pattern, texture to see whether it suits your home. If you happen to order a patterned fabric, the full scale of the print is not seen on the free fabric swatch. So we provide you with a digital photocopy of the print to give you a better idea of the fabric look. Once you are satisfied with the fabric, place your order as soon as possible as we have designer fabrics in exclusive but limited stocks. Our fabric shop will never disappoint you as there is some Sale for every season and every reason. Browse our site collection to acquaint yourself with all the fabrics you can explore this season. We have an Easter promo code with the help of which you can avail discount at our Easter Sale of upholstery fabrics. Christmas Sale in the winters will help you purchase goodies for all your DIY Xmas projects too. Explore our designer fabrics and widen your horizon of exuberant upholstery fabrics. 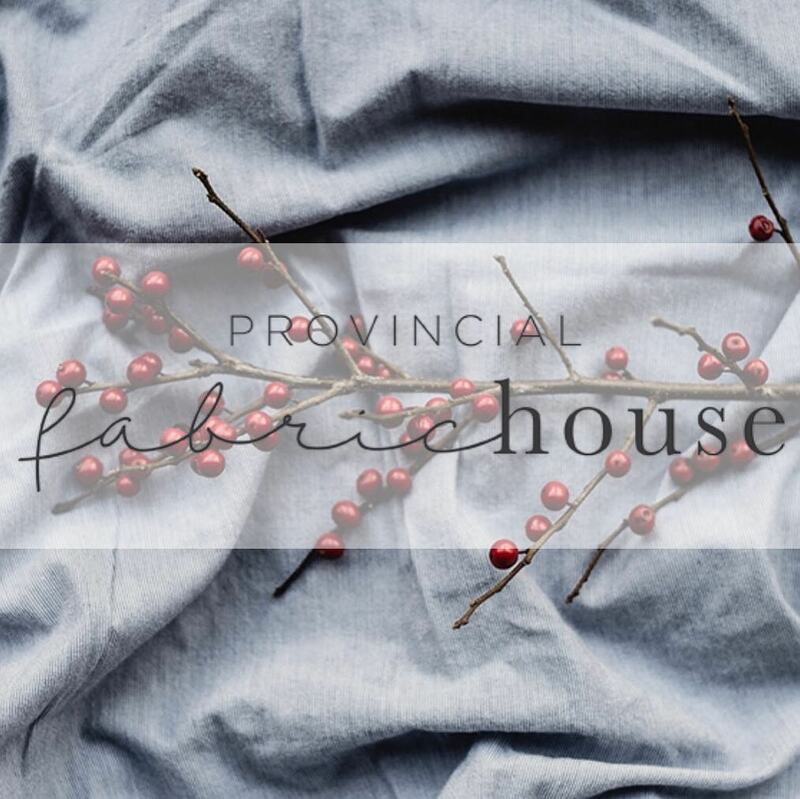 Provincial Fabric House has its own Newsletter to keep you updated about limited editions, latest fresh arrivals, designer fabrics, new projects, seasonal sales, and discounted fabrics. Subscribe our Newsletter so that you do not miss out on any fresh information. We have a discount on fabrics with less than 5 meters of stock roll. These are limited and cannot be replaced. They are most suitable for your small home décor projects and furnishings like cushions, pillows, soft furnishings, DIY craft projects, and small chair upholstery. Grab these discounted offers today to build a vibrant upholstery piece at affordable prices.